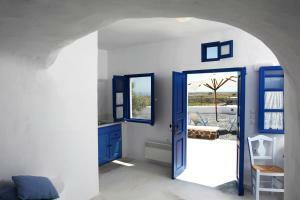 The Cycladic style Aghios Artemios Traditional Houses is located on the east coast of Santorini, at 100 meters above sea level. The hotel recommends renting bicycles or cars, or using other means of transport, as the area requires it. It offers views of the courtyard of the picturesque graveyard. Spacious accommodation that includes a seating area and views of the picturesque cemetery. Spacious accommodation on the upper levels of the building with a seating area and a large terrace overlooking the Aegean Sea. This 2-style cave-style suite is decorated in a traditional style and features a seating area with satellite TV. It offers a minibar and an additional bathroom 1. 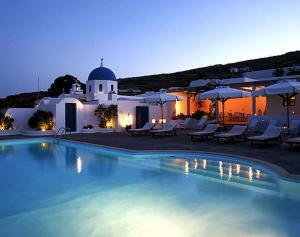 This Cycladic-style suite has a seating area, satellite TV and a minibar. 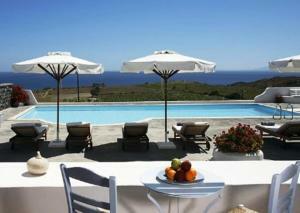 It also includes a spa bath with views of the Aegean Sea. Includes spacious living room with 2 single sofa beds and 1 separate bedroom with 1 double bed and bathroom.